She did not start out as a corporate PR person. Yet, just last year alone, she was featured 24 times on magazine article pieces (Glamour / Forbes), podcasts, major blog sites, and various speaking engagements. If that is not enough, she also scored to be a regular contributor on HuffPost and Thrive Global. She accomplished this all by herself without hiring a PR professional. What is the ROI from all of this? 2. She was able to quit her day job 2 months earlier than planned to turn this into a full-time business. 3. People stopped questioning her credibility, and as a result, her calls with prospects became much easier. So, what is her secret?! In this post, I’m going to share 5 major takeaways from Tara’s presentation. So, read on! #1: Clarity Comes from Taking Action. It's okay not to figure it all out to start something. If you keep telling yourself, "I don't know if I'm ready. I don't have my sweet spot all worked out," you don’t have to. You can figure it out as you go along by working to put yourself out there. Tara is the living proof that a series of action truly can help gain clarity with your vision, direction, and purpose in your professional life. She started her career as a nurse. While she took on night shifts, she was experimenting with other business opportunities to find the one that felt aligned with her superpower that inspires people. This was not an overnight success by any means. But, she kept going. Eventually, she found a way to land a job that allowed her to work on her business at night. From there, she came up with a transitioning plan to be a full-time business owner. Amazingly, she was able to leave her previous day job 2 months earlier than she originally planned by narrowing her niche and getting more visibility for her coaching & consulting firm. try new things, however small, each day. Working to increase your visibility serves as good practice to push your business idea forward. It makes you think about how you could help others with what you already know and what you have experienced. Tara has explored many avenues by investing in herself. Although she is a self-proclaimed introvert, she had built a large network of like-minded people by helping them through live events, social media, and diligent networking. Each step she took, she discovered what made her excited, what worked and what didn’t work, and how she can help people with what she naturally does well. Instead, Tara believes you are ready for media exposure if you have an unique view or an approach to solve a problem for those who are a few steps behind you. Unlike paid media (ads), earned media does not give you much control in terms of timing, topics, and angle. This is because journalists will take the information and package it to best serve their audience with value. Because of this, you might be in for a surprise to see a finished product being different from what you anticipated. What you need to keep in mind is that, regardless of what the outcome is, your role is to help readers or viewers with your expertise. That is why even if a piece turned out to be slightly different from what you originally planned, you should be grateful for the opportunity to share your insights with a group of people you otherwise had no access to. There are a few things you do have control over that will help minimize the gap between your expectation and a finished piece. That's explained under #4.
media professionals & readers / viewers. Tackle your DIY PR project with this in mind. While you work on takeaway #3, 4 & 5, you will notice the difference in your results by being intentional about the value you are providing as opposed to focusing on getting yourself featured. #3: Before You Pitch, Do the Frontloading Work to be Everywhere. 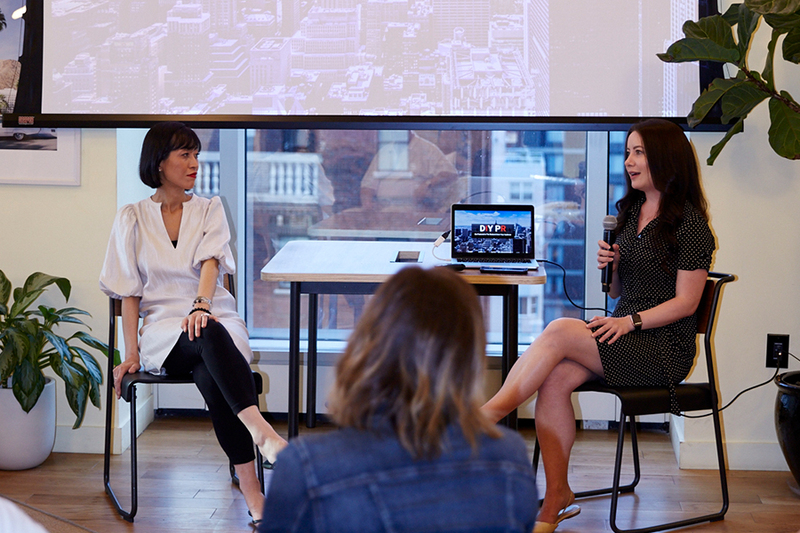 The important key Tara shared is to reverse-engineer the DIY PR journey. Assume you get featured on a podcast or two, or you may be given an opportunity to guest-post on a major blog site where your prospects hang out, you want to be sure that they can find you elsewhere easily without having to do massive research on you. In order to achieve this, increasing awareness of you and your services must start right now. Tara shared how she was able to become a regular contributor to Thrive Global. They reached out to her because they saw one of her Facebook post. If you are consistent with your posts, an opportunity like this can happen to you! “I know this sounds like a cliché, but quality over quantity, always,” said Tara. It can be FB Live or treating Instagram as your micro-blogging place so long as your direct your audience back to your website. This is because you don’t want to keep all your content on borrowed platforms which you have no control over. All social media platforms should be considered as “borrowed platforms.” Facebook, YouTube, Twitter, Pinterest, Snapchat…these platforms can change their rules and/or algorithm at any given moment. What you don’t want is to solely depend on these platforms to engage with your audience. If any of these go down or your account gets shut down, you will have no way of reaching out to your audience. On your website, it’s a good idea to have a valuable but digestible piece such as a checklist, a short step-by-step guide or a resource list that visitors can download by signing up on your email list. You may have seen articles talking about how email marketing is dead, but it is still far from it. Email still is a good way for you to keep your audience informed with your offers. Also, don’t forget that this is an ongoing process. You should continue this effort while you are pitching. One more thing – we did not go into this extensively at the event, but I want to be sure that, if you are a product-seller, you must prep your back end to handle additional orders and inquiries coming from being featured on media. Believe it or not, some businesses ended up going out of business because they could not handle a sudden surge in orders by being featured on a national TV or a major podcast. Don’t let that happen to you. #4: Keep Timely & Valuable Topics in Your Pocket, Well in Advance. One thing to keep in mind when it comes to media and publication is that they are always racing against deadlines. In general, everything happens fairly quick. On top of their editorial calendars, they are always on a lookout for major news and related topics to stay relevant for their readers and viewers. As a start, keep a few topics that are unique and enticing handy. This goes to show that prepping is the bulk of the work. Once you have a handful of good topics, you are equipped to handle “out of nowhere” requests without missing a beat. Being flexible and being available will be highly appreciated by media professionals. From there, you have a much better chance of developing personal relationships with some of them so that you will be called back time and time again. 1. Avoid “course of knowledge” and have topics that are “broad enough” to appeal to a wider audience without getting too technical to meet readers or viewers at where they are. 2. Be sure to research what’s popular on their sites or channels. If you monitor them closely, you will start to spot trends and patterns. You can easily see how many people shared an article or video. You study those. 3. Once you get the idea of what topics resonate the most with their audience, explore ways to make your topic better by offering a different viewpoint or a different approach to solve a problem and/or accomplish something. As Tara mentioned, quality is important. But to take it one step further, when you are doing DIY PR, a combination of quality & timeliness is the winning formula. “Timeliness” has 2 sides: One is that your topic is timely and something people are already paying attention to. The other is more about how fast you can get it ready for media or publications so that you get to be the go-to person when they are under the enormous time pressure. Journalists, editors and media professionals are always exposed to an extremely demanding schedule. What they value more than anything would be to make their lives easier for them to do their job. That’s where this tip of “Give a Star Treatment” comes to play. “This is like the biggest secret,” said Tara. Her immense success in being featured 24 times a year all comes down to this. She did everything she can possibly think of to make her media contacts’ job easy. 1. Keep your email message short, clear, and to the point. 2. State why this is valuable to their readers/viewers up front. 3. Bullet-point how you plan to bring this value (summary). 4. Add any supplemental information about you that they can learn in your email i.e. a short bio, contact info and social media handles. 5. Pitch a specific topic that you want to be known for. 6. Follow submission guidelines unless you are prepared to take a calculated risk to stand out from the crowd, which may or may not reduce a chance of getting picked. 1. Don’t make them work by inserting multiple links that they need to take extra steps to get to your info. 2. Don’t pitch multiple unrelated topics just because you can cover them. 3. Don’t be overly aggressive with your follow-ups. Do follow up but be courteous and be mindful of their schedule. 5. Don’t use a script that is not customized for this specific contact you are reaching out to. Starting your email with “I love your show,” & “I am a big fan” without being able to specify why and which one is your favorite is a sure way to get your email deleted. Are You Ready to Tackle “Why Should We Hire You?” Objection by Being Recognized as an Expert? If you made it through to this point, congratulations! You are ready to take a big step towards new opportunities to be discovered by people who are needing your guidance and expertise. 3. What kind of a mindset shift needed after you get featured & what you need to do? 4. Tips to build authentic relationships with media professionals that pros don’t want you to know. 5. How to keep people coming back to your site after you capture their attention. 6. Why you should opt for good media training before appearing in front of a camera. But, don’t let FOMO take over your head space. You can head over to www.tararaebradford.com/join-the-list to receive weekly communication strategies and confidence tips in their inbox. To tackle a project like this one, you want a good support system so that your journey will be a direct route to epic success. Tara will leave no one behind. She understands your worries, resistance, and hesitation while venturing out to a new world in business because she has been there herself. Take a deep breath, and #GiveYourselfAPermission to be discovered. There are people out there who are longing for a solution and support that you can provide. Allow yourself to be discovered by them!